Understanding the spatial and temporal variation in soil respiration within small geographic areas is essential to accurately assess the carbon budget on a global scale. In this study, we investigated the factors controlling soil respiration in an altitudinal gradient in a southern Mediterranean mixed pine–oak forest ecosystem in the north face of the Sierra de Guadarrama in Spain. Soil respiration was measured in five Pinus sylvestris L. plots over a period of 1 year by means of a closed dynamic system (LI-COR 6400). Soil temperature and water content were measured at the same time as soil respiration. Other soil physico-chemical and microbiological properties were measured during the study. Measured soil respiration ranged from 6.8 to 1.4 μmol m−2 s−1, showing the highest values at plots situated at higher elevation. Q 10 values ranged between 1.30 and 2.04, while R 10 values ranged between 2.0 and 3.6. The results indicate that the seasonal variation of soil respiration was mainly controlled by soil temperature and moisture. Among sites, soil carbon and nitrogen stocks regulate soil respiration in addition to soil temperature and moisture. Our results suggest that application of standard models to estimate soil respiration for small geographic areas may not be adequate unless other factors are considered in addition to soil temperature. Communicated by A. Merino and A. Blanco. 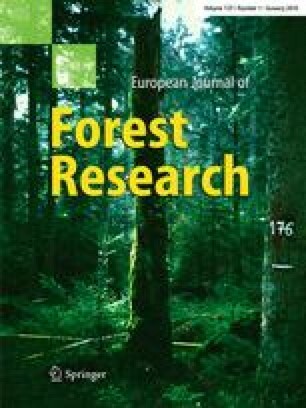 This article belongs to the special issue “Plant–soil relationships in Southern European forests”. This research was conducted in the framework of Spanish HU2005-0023, AGL2004-01941 and CGL 2006-02922/CLI projects and the European COST 639 (BurnOut) project. The authors would like to express their gratitude to Mr. Javier Dones, Mr. Manuel Lopez Arias and Mr. Jose M. Grau for their valuable assistance with field aspects and for the data provided.